PIE TIME takes place in the Southern Highlands in June each year. on Thursday 21 March at 10:30am. The document below outlines opportunities for your business, and we ask you to Express Your Interest (EOI) using the online form link below. 11 September 2018 – You can view the presentation below. Destination Southern Highlands’ (DSH) award winning PIE TIME promotion will run from 1-30 June 2019. 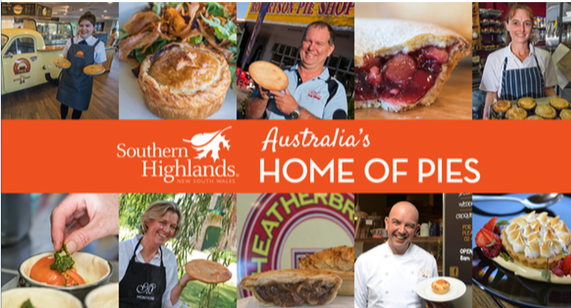 This month long promotion will continue to endorse the Southern Highlands ‘Australia’s Home of Pies’ and the place to come and experience via a wide range of trade and consumer events. We need industry partners to develop deals, products, experiences and events for the month of June so that we can include in our extensive marketing efforts. There’s nothing more warming than a gourmet winter pie. The Southern Highlands is home to award winning pie makers and with over 28 pie outlets in the region it is quickly becoming known as the ultimate pie destination. Why not eat your way around the Southern Highlands Pie Trail and sample the range of pies made in house at local restaurants, bakeries and cafes. Each pie maker has a hero product carefully selected from the range of incredible produce we have right here on our doorstep. The PIE TRAIL operates every day not just in June. Would you like your business to be included on the GREAT PIE TRAIL? A meeting was held to bring together bakers, cooks and chefs from around the Southern Highlands. The presentation from the meeting can be downloaded below. Destination Southern Highlands welcomes your feedback on PIE TIME.